This page Nun is part of the mysticism series. A nun is a member of a Christian religious community of women who live by certain vows and usually wear a habit and living in cloisters. The practice of living in cloisters started with the periculoso ruling. In the Catholic Church, a nun is a female who has taken solemn vows (the male equivalent is often called a "monk", although the positions actually entail very different religious origins and constitute very different duties within the church). Nuns are cloistered to the degree established by the rule of the religious institution they enter. In the Roman Catholic tradition, there are a number of different orders of nuns each with its own charism or special character. In general, when a woman enters a convent she first undergoes an initial period of testing the life for a period of six months to a year. If she, and the order, determine that she may have a vocation to the life, she receives the habit of the order (usually with some modification to distinguish her from professed nuns) and undertakes the novitiate, a period (that lasts one to two years) of living the life of a nun without yet taking vows. Upon completion of this period she may take her initial, temporary vows. Temporary vows last one to three years, typically, and will be professed for not less than three years and not more than six. Finally, she will petition to make her "perpetual profession", taking permanent, solemn vows. In the various branches of the Benedictine tradition (Benedictines, Cistercians, Camaldolese, and Trappists among others) nuns take vows of stability (that is, to remain a member of a single monastic community), obedience (to an abbess or prioress), and "conversion of life" (which includes the ideas of poverty and chastity). The "Poor Clares" (a Franciscan order) and those Dominican nuns who lived a cloistered life take the three-fold vows of poverty, chastity and obedience. Most orders of nuns not listed here follow one of these two patterns, with some orders taking an additional vow related to the specific work or character of their order (for example, to undertake a certain style of devotion, praying for a specific intention or purpose). Cloistered nuns (Carmelites, for example) observe "papal enclosure" rules and their monasteries typically have walls and grilles separating the nuns from the outside world. 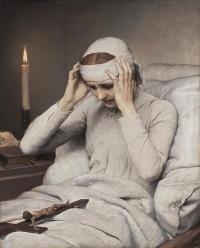 The nuns rarely leave (except for medical necessity, or occasionally for purposes related to their contemplative life) though they may have visitors in specially built parlors that allow them to meet with outsiders. They are usually self-sufficient, earning money by selling jams or candies or baked goods by mail order, or by making liturgical items (vestments, candles, bread for Holy Communion). They sometimes undertake contemplative ministries—that is a monastery of nuns is often associated with prayer for some particular good or supporting the missions of another order by prayer (for instance, the Maryknoll order includes a monastery of cloistered nuns who pray for the work of the missionary priests, brothers and religious sisters; the Sister Disciples of the Divine Master are cloistered nuns who pray in support of the religious sisters of the Daughters of Saint Paul in their media ministry; the Dominican nuns of Corpus Christi Monastery in the Bronx, N.Y., pray in support of the priests of the Archdiocese of New York). A canoness is a nun who corresponds to the male equivalent, a canon. The origin and rules of monastic life are common to both. As with the canons, differences in the observance of rule gave rise to two types: canons regular and secular canons. A nun who is elected to head her monastery is termed an abbess if the monastery is an abbey, a prioress if it is a priory, or more generically may be referred to as the Mother Superior and styled "Reverend Mother". The distinction between abbey and priory has to do with the terms used by a particular order or by the level of independence of the monastery. Technically, a convent is any home of a community of sisters—or, indeed, of priests and brothers, though this term is rarely used in the U.S. The term "monastery" is often used by communities within the Benedictine family, and "convent" (when referring to a cloister) is often used of the monasteries of certain other orders. In modern English, the word "nun" is commonly used for all women religious and this term is acceptable in most informal situations, however, to be technically correct, in the Catholic Church, the terms "nun" and "religious sister" have distinct meanings. Women belonging to communities like the Sisters of Charity or Third Order Franciscans are religious sisters, not nuns. Nuns and sisters are distinguished by the type of vows they take (solemn vows vs. simple vows) and the focus of their good works. The type of vows that are taken are dependent on the Constitutions and/or rule of each community, which are submitted for approval to the Congregation for Institutes of Consecrated Life and Societies of Apostolic Life, a body of the Roman Curia. The religious community of a nun is referred to as a "religious order" while the religious community of a sister is referred to as an "institute" or "congregation". Hence, all nuns are religious sisters, but not all religious sisters are, properly speaking, nuns. recite the Liturgy of the Hours or other prayers together with her community. Nuns are restricted from leaving the cloister, though some may engage in teaching or other vocational work depending on the strictness of enforcement, which is up to the monastery itself. Visitors are not allowed into the monastery to freely associate with nuns. In essence, the work of a nun is within the confines of her monastery, while the work of a sister is in the greater world. Both sisters and nuns are addressed as "Sister". There may be both nuns and sisters within a religious movement. For instance, the Poor Clares (called "Second Order Franciscans") are cloistered nuns following the Franciscan tradition, while the Sisters of St. Francis are among the many groups of "Third Order Regular Franciscans" (see Third Order of St. Francis), who exist to teach, work in hospitals or with the poor or perform other ministries. This also applies to the difference between cloistered Dominican nuns and groups of Dominican Sisters who are dedicated to teaching or working with the sick. In the Eastern Orthodox Church there is no distinction between a monastery for women and a monastery for men. In Greek, Russian, and other Eastern European languages, both domiciles are called "monasteries" and the ascetics who live therein are "Monastics". In English, however, it is acceptable to use the terms "nun" and "convent" for clarity and convenience. The term for an abbess is the feminine form of abbot (hegumen)—Greek: hegumeni; Template:Lang-sr(Igumanija); Russian: игумения, (igumenia). Orthodox monastics do not have distinct "orders" as in Western Christianity. Orthodox monks and nuns lead identical spiritual lives. There may be slight differences in the way a monastery functions internally but these are simply differences in style (Gr. typica) dependent on the Abbess or Abbot. The Abbess is the spiritual leader of the convent and her authority is absolute (no priest, bishop, or even patriarch can override an abbess within the walls of her monastery.) There has always been spiritual equality between men and women in the Orthodox Church (Template:Bibleverse). Abbots and Abbesses rank in authority equal to bishops in many ways and were included in ecumenical councils. Orthodox monasteries are usually associated with a local synod of bishops by jurisdiction, but are otherwise self governing. Abbesses hear confessions (but do not absolve) and dispense blessings on their charges, though they still require the services of a presbyter (i.e., a priest) to celebrate the Divine Liturgy and perform other priestly functions, such as the absolution of a penitent. Novice—When one enters a monastery the first three to five years are spent as a novice. Novices may or may not (depending on the abbess's wishes) dress in the black inner robe (Isorassa); those who do will also usually wear the apostolnik or a black scarf tied over the head (see photo, above). The isorassa is the first part of the monastic "habit" of which there is only one style for Orthodox monastics (this is true in general, there have been a few slight regional variations over the centuries, but the style always seems to precipitate back to a style common in the 3rd or 4th century). If a novice chooses to leave during the novitiate period no penalty is incurred. Rassaphore—When the abbess deems the novice ready, the novice is asked to join the monastery. If she accepts, she is tonsured in a formal service during which she is given the outer robe (Exorassa) and veil (Epanokamelavkion) to wear, and (because she is now dead to the world) receives a new name. Nuns consider themselves part of a sisterhood; however, tonsured nuns are usually addressed as "Mother" (in some convents, the title of "Mother" is reserved to those who enter into the next level of Stavrophore). Stavrophore—The next level for monastics takes place some years after the first tonsure when the abbess feels the nun has reached a level of discipline, dedication, and humility. Once again, in a formal service the nun is elevated to the "Little Schema" which is signified by additions to her habit of certain symbolic articles of clothing. In addition, the abbess increases the nun’s prayer rule, she is allowed a stricter personal ascetic practice. Great Schema—The final stage, called "Megaloschemos" or "Great Schema" is reached by nuns whose Abbess feels they have reached a high level of excellence. In some monastic traditions the Great Schema is only given to monks and nuns on their death bed, while in others they may be elevated after as little as 25 years of service. Anglican religious orders are organizations of laity and/or clergy in the Anglican Communion who live under a common rule. The term "religious orders" must be distinguished from Holy Orders (the sacrament of ordination which bishops, priests, and deacons receive), though many communities do have ordained members. Religious communities throughout England were destroyed by King Henry VIII when he separated the Church of England from the papacy during the English Reformation (see Dissolution of the Monasteries). Monasteries were deprived of their lands and possessions, and monastics were forced to either live a secular life or flee the country. With the rise of the Catholic Revival and the Oxford Movement in Anglicanism in the early 1800s came interest in the revival of "religious life" in England. Between 1841 and 1855, several religious orders for nuns were founded, among them the Community of St. Mary at Wantage and the Community of St. Margaret at East Grinstead. Some churches that are directly descended from the Reformation, such as Lutherans, and some Calvinists continue to have small monastic communities, though these generally play a much smaller role in religious practice than in Roman Catholic or Orthodox churches. Most Protestant monastic communities are not organized into formal orders. Unless indicated otherwise, the text in this article is either based on Wikipedia article "Nun" or another language Wikipedia page thereof used under the terms of the GNU Free Documentation License; or on original research by Jahsonic and friends. See Art and Popular Culture's copyright notice. This page was last modified 16:13, 17 January 2015.